The Hyflow project is developing concurrency control abstractions, protocols, and mechanisms for current and emerging multicore architectures, cluster systems, and geographically distributed systems. A particular focus is to understand what concurrency control abstractions promote high programmability for these architectures, and how to support those programming abstractions with high performance, scalability, and dependability. A closely related focus is to build open-source experimental systems that embody the techniques, as well as incorporate them into existing open-source infrastructures. The project has developed algorithms and mechanisms for the transactional memory concurrency control abstraction, transactional data structures, state machine replication techniques, and scalable consensus algorithms for geographically distributed systems. A recent focus is on the Byzantine failure model - an increasingly important failure scenario for cloud infrastructures - and developing consensus algorithms with high performance and scalability for that model. Latency of Caesar, a multi-leader consensus algorithm, and its competitors including EPaxos (SOSP'13) and M2Paxos (DSN'16), on a key-value benchmark, as the degree of contention increases. For details, see our DSN 2017 paper. 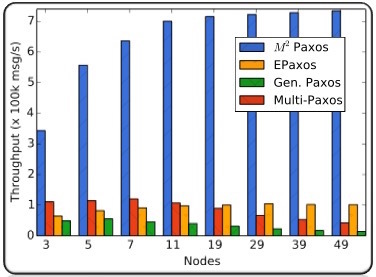 Throughput of M2Paxos, a Generalized Consensus algorithm, and its competitors including EPaxos (SOSP'13), Generalized Paxos, and Multi-Paxos under varying number of nodes. Application workload includes write commands issued on keys, with 100% command locality. For details, see our DSN 2016 paper. This work is supported in part by US National Science Foundation under grants CNS 0915895, CNS 1116190, CNS 1130180, and CNS 1217385, and AFOSR under grants FA9550-14-1-0163 and FA9550-14-1-0143. Any opinions, findings, and conclusions or recommendations expressed in this site are those of the author(s) and do not necessarily reflect the views of the National Science Foundation or AFOSR.